Join us on Sunday, May 6 for the Gala in the Garden and Rare Plant Auction. This signature event is designed for passionate gardeners, featuring rare and hard-to-find plants. Enjoy a wonderful afternoon at the JC Raulston Arboretum with wine, craft beer, and light hors d’oeuvres served on the lawn. Auction Questions? Contact Lisa Meares at (919) 515-1139 or lameares@ncsu.edu. Mahonia shenii – I think this is the first public offering of this plant in the US. Daphniphyllum teijsmannii 'Mountain Dove' – The most asked for plant currently at the JCRA, extremely difficult to propagate so virtually never available. Platycladus orientalis 'Franky Boy' – Such a cool look in the garden. Stewartia ovata 'Inner Light' – A very cool new introduction from Polly Hill Arboretum with burgundy flushed new growth and ruffled white flowers with a shockingly gold boss of stamens. Allium narcissiflorum – Wide gray-green leaves topped with delicate clusters of nodding pink flowers - very cool. Tricyrtis lasiocarpa – Tony Avent's collection from our 2008 trek to Taiwan, it bears huge leaves and delicate flowers best in more sun than other toadlilies. Sassafras tzumu – Seedling from our spectacular tree - certainly one of our favorite harbingers of spring! Clematis (evergreen species) – One of our wild collections which we haven't keyed out yet. Lovely glossy green foliage often highlighted with silver with 1" four petaled white flowers in spring. Watch Mark Weathington discuss the rare plant auction and the plants in two YouTube videos (1 and 2). For additional information about our sponsors or how to become a sponsor, please click the red button below. 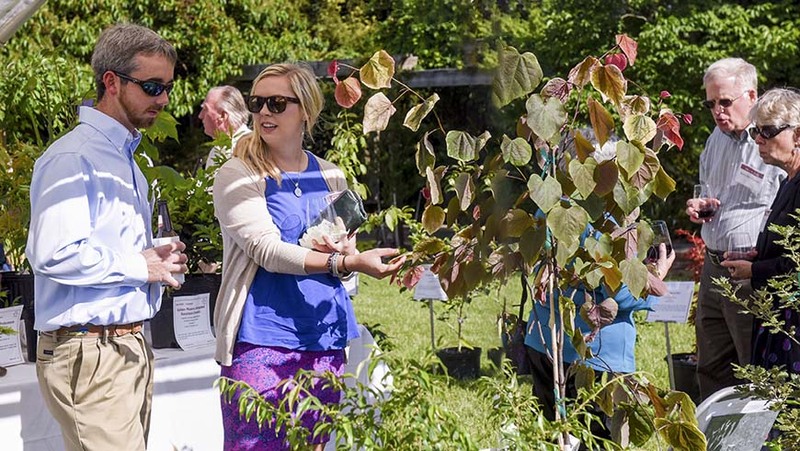 The proceeds raised each year are the critical unrestricted funds used for daily operational expenses and ongoing research of landscape plants at JC Raulston Arboretum. The JC Raulston Arboretum's Gala in the Garden is co-sponsored by and fund-raising efforts operate under the auspices of the North Carolina Agricultural Foundation, Inc., a 501(c)3 organization. Tax ID number is 56-6049304. You will receive an official receipt for the tax-deductible portion of your donation. Advance registration is required. Please RSVP online by April 30 using our registration site. Please contact Kathy Field Kathy at (919) 513-0264 or kathy_field@ncsu.edu with your registration questions and contact Jennifer Bernabi at (919) 515-6212 or jennifer_bernabi@ncsu.edu for more information about the Gala.